Each year, the Internal Revenue Service (IRS) allows you to gift money or property to anyone you choose up to a maximum limit. Gifts above this amount are taxed on your tax return. 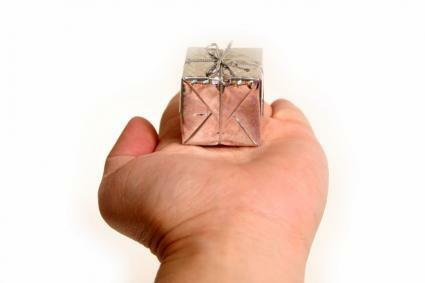 If you receive a gift, you do not owe taxes, unless and until you sell the gift for a profit. The federal gift tax is a tax on gifts to anyone -not just family members- valued at more than the yearly maximum. Your gift can be either monetary, such as cash or a check, or property, either personal or real estate. For 2013, the maximum yearly limit for a single donor and a single gift is $13,000; however, you can gift to more than one person the maximum each year and not incur taxes. The gift amount changes each year; check the IRS website for the current year's maximum. The definition of "gift" includes not only tangible items, but also the amount of any low or no-interest loans you might make and the value of any property you sell for less than its value. Gifts do not include medical costs or tuition you pay directly to the provider on someone else's behalf, gifts to your spouse, or donations to political organizations. Gifts are valued by their fair market value, which is the amount of money a reasonable buyer would pay for the item. Usually, the location in which the gift was made is included in the determination of fair market value. Every individual is entitled to give gifts. Therefore, spouses are not limited to giving a single gift of $13,000, but can instead give as much as $26,000 in cash or property to a single person. A gift does not reduce the amount of a donor's taxable income, and is therefore not a deduction. It does, however, reduce the overall value of an estate, which may be important when the donor dies. Donors are responsible for providing information about any gifts over the maximum on their tax returns. They must complete Form 709, titled "United States Gift Tax Return," and submit it simultaneously with their tax return. Gifts under $13,000 do not need to be claimed and do not require donors to file Form 709. Donors are also responsible for paying taxes on the amount of any gift exceeding the $13,000. A single donor of a gift valued at $20,000, for example, will pay taxes on $7,000 of the gift. Recipients need to do nothing to receive a gift, except smile and say thank you. They pay no taxes on the gift they receive, and do not need to file any additional forms or information with their tax return. The exception to this is if the recipient later sells the gift for a profit. They must include any income they make from selling a gift on their capital gains on the corresponding year's tax return. The IRS taxes large estates of decedents. This tax differs from a gift tax in that it applies to an entire value of an estate and applies only after the estate owner dies. Gifts made during the owner's lifetime, which did not create a tax obligation, are not included in an estate. For this reason, many large-estate owners repeatedly make gifts throughout their lifetime to reduce the size of their estate and the amount of taxes their heirs must pay. Seek advice from an attorney or accountant before making gifts larger than the yearly allowable maximum. An experienced tax professional will explain the specifics of the gift tax rules to you and assist you in minimizing your tax obligations.